What (alternatively) about Oh /I don't know with less or no rise on "know"? Maybe less polite, implying the other's opinion is not much worth considering. It's probably my non-native instincts regarding English failing, but I find a rise sound odd. I'd definitely expect "know" to have a fall, mirroring "bad". "/Oh I don't \know. It /\might not be so \bad." (or something, I'm really bad describing intonation contours). "I don't know : it might not be so bad." Then the rise would simply be the oral form of the colon, with the meaning "I speaker am going to add something". I do have a slight rise on "know", but my big rise (and main stress) are on "I", something like "Oh, /I don't /know". I can't tell if I have an actual fall on "don't" or if it's simply much lower than the target of the rise on "I". I'm not versed enough in the study of intonational contours to tell if this differs fundamentally from what you have above, but if so, maybe it's an American thing? Ryan, I think you are probably making "I" the nucleus and using a rise-fall-rise (which is an elaborate version of the fall-rise, p. 220 in my book). But surely this has a different meaning. 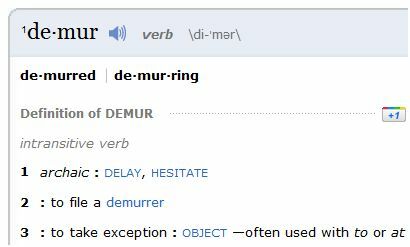 It is not the demurring discussed in my posting. Rather, you'd use this pattern to show indignation that the interlocutor should expect you to know something so recherché. "What's the capital of Tuvalu?" There are usually LOTS of intonation patterns possible for a given sentence. The problem is fitting them to the pragmatics. I can see how my notation implied this pattern, but it's not quite what I meant. The nucleus is definitely on "I", and my rise on "know" (for the relevant context) goes up very little, and in fact I suspect the rise isn't obligatory, but the low tone on "know" is. In a response to "What's the capital of Tuvalu?" the rise on know goes up almost as high as the nucleus on "I". Though I don't know if that explanation is any clearer. The monosyllabic utterances are specially drawn out to carry the contour. For me, the height and narrowness of the range are crucial. With a more normal range or greater, and/or in a lower register the intonation becomes more challenging. As with my fall-rise, the rhythm and register are crucial. Sounds like both an aggressive ("what's going on here?") and a defensive intonation ("How would I know?" or "I don't know, constable. "), very similar to the one John describes but altogether higher. How would ↘I ↗know? would have to be much faster for me. I don't ↘know ↗constable would have a wider range. What's going ↘on ↗here? would have to be both faster and wider. I try to be one of the 'followers of Brazil's theories' — though I don't have the details — or even where to look up the details — at my finger tips. Still, one thing Brazil does is to lead me to expect that a rise will quite likely be followed by a resolving fall. It might not be so ↘bad — which 'proclaims' what the speaker really thinks. The first part is essentially a polite reaction — delaying, and thus mitigation the following disagreement or otherwise contrasting view. We make it even more polite if we suppress the second part. We set up the expectation of a contrasting view — but leave it unstated. I agree with Lipman that proceeding straight to the 'proclaiming' fall would make the utterance less polite.